Lani M. Lombardi is a Partner with Cleary Giacobbe Alfieri & Jacobs, LLC, and has been practicing law for over eighteenteen years. Ms. Lombardi currently concentrates her practice on real estate tax appeal litigation defense; municipal court defense; and land use litigation, including the handling of land use prerogative writ actions. Throughout her professional career, Ms. Lombardi has represented various governmental clients, including Monmouth County; as well as planning boards, zoning boards and public utility authorities in public entity litigation. She has also provided competent and advantageous representation to both individual and corporate clients in both New Jersey State and appellate courts in civil/commercial litigation actions, estate planning and administration and guardianship actions, landlord-tenant matters, real estate matters. 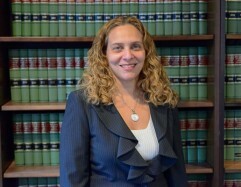 Ms. Lombardi also has extensive New Jersey Municipal Court experience, having served as Municipal Prosecutor in the Joint Court of Hazlet Township and Matawan Borough, and Hazlet Township; Conflict Municipal Prosecutor in Brick Township; Associate Municipal Prosecutor in East Brunswick Township; Conflict Public Defender in Brick Township; and Associate Public Defender in Matawan Borough and Howell Township. Prior to joining the firm, Ms. Lombardi practiced Plaintiff’s mass tort litigation for three years.